Short rides, long rides…it really doesn't matter; I always rock a big hydration pack—my usual rig of choice being Osprey's Zealot 16. I have a hard time fitting the kitchen sink in anything smaller than that. I'm that guy who brings the 26 and 29er tube, the pump, the energy bars, the gels, the mini tool, the compass, the emergency blanket, the first aid kit and the fixed-blade hunting knife, because, you just never know when you'll need to gut and skin something big and furry in the middle of a ride. I've grown accustomed to wobbling down the trail like a mobile Quasimodo and have never really sought out a more compact hydration pack. Until recently, that is. This year's Bible of Bike Tests Trail/All Mountain test loop starts and ends out of our front door. Though it's a surprisingly punishing loop, it's also a short one—just under four miles…which means running my great haversack of a hydration pack is a bit of overkill. 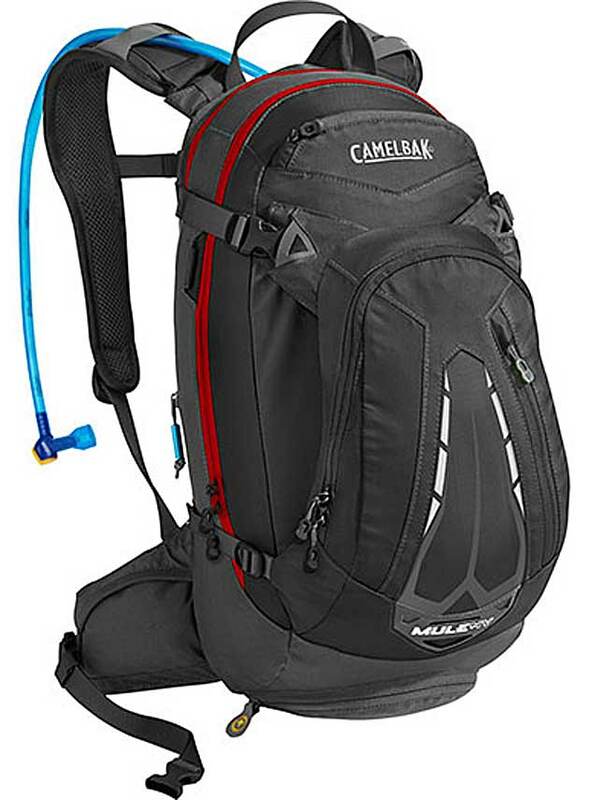 This CamelBak M.U.L.E. NV was the perfect option. As the name suggests, the M.U.L.E. NV truly holds a hell of a lot of gear; mine is currently stuffed with a tube, tool, pump, energy bars and a rain jacket….and I still have plenty of room for more. In total, you're looking at a spacious 732 cubic inches of storage space. The M.U.L.E. NV sports a helmet hook, media pocket, bike tool organizer pocket, stash pocket, four-point compression, overflow storage, dual waist belt pockets and integrated rain cover. Like I said, a good bit of storage. Nevertheless, the CamelBak cuts a relatively trim silhouette. It's a nice balance. 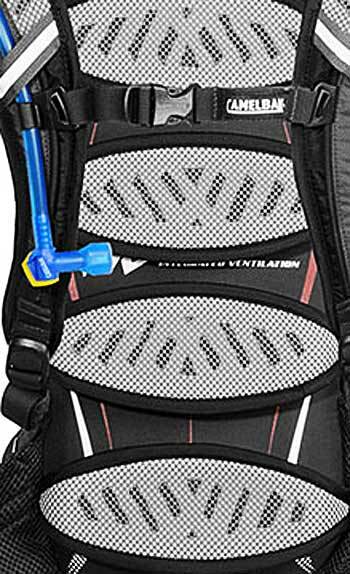 The articulating pads on the CamelBak’s back panel keep things from getting too close for comfort. The M.U.L.E. NV is also quite comfortable, outfitted as it is with ventilated straps and a back panel that sports articulating pods that keep the pack from resting its entire bulk along your sweaty back. Last, but not least, the 100-ounce bladder is large enough to accommodate your hydration needs on longer rides and it's just plain hard to match the excellent bite valve and ease of cleaning/filling that comes part and parcel with any CamelBak bladder—probably the standout gizmo in all their packs. The M.U.L.E. NV doesn't come cheap, but given the overall build quality and smart features, I wouldn't expect it to. 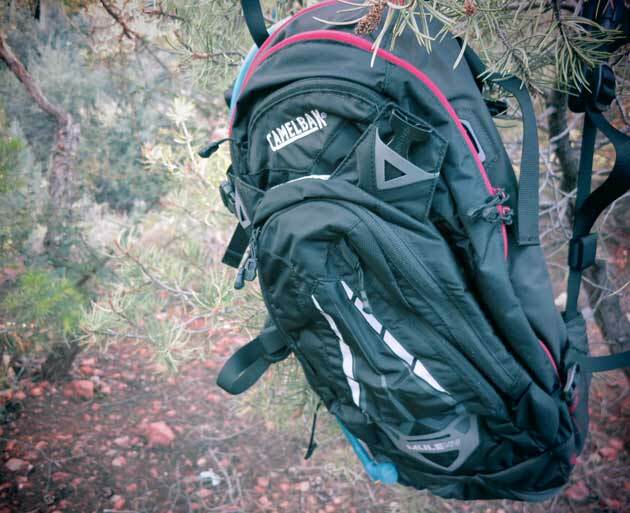 For anything other than expedition-length rides, this is a pack that just gets the job done. Or, at least it does at this point. Stay tuned for a long-term review of the CamelBak.